“Single-minded shocker with virtually no plot, just a succession of bloody attacks in semi-darkness. Very well done if you like that kind of thing” – Leslie Halliwell. 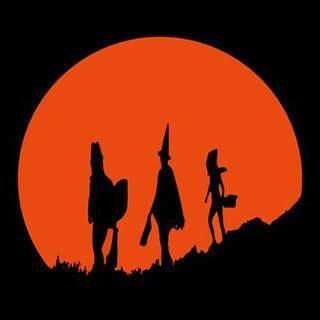 What better movie to celebrate the night of pumpkins, dodgy costumes and candy than Halloween? Made on a shoestring budget during one month in 1978, it became a huge commercial success, spawning a bag of sequels, a remake and scores of inferior copycats. Once upon a time, horror movies consisted of vampires or werewolves; enjoyed a limited audience (if at all); and received even less (if any) critical attention. The astonishing success of The Exorcist (1973) awoke other filmmakers to the terrific popular and lucrative potential that the horror genre could bring. Wes Craven’s Last House On The Left (1974), Tobe Hooper’s Texas Chainsaw Massacre (1975) and Brian De Palma’s Carrie (1976) were all landmark features, unleashing a new breed of horror movies on an unsuspecting mainstream audience. Fortunately produced outside the Hollywood system, they excelled as low-budget but visionary frighteners, introducing a more confrontational – and ultimately more horrifying – style of filmmaking. “[Jamie Lee Curtis] was just one of several girls auditioning for Halloween. She came in to read. She had a tremendous quality… Different! Very tomboyish in a way… And I never knew she was related to Janet Leigh at all!” – John Carpenter. 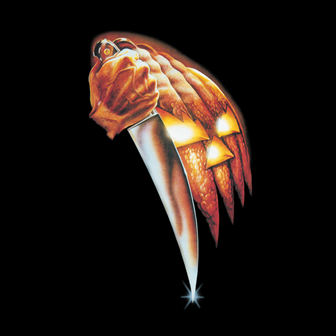 Directed by John Carpenter – who had received moderate success with Assault on Precinct 13 – and produced by then-partner Debra Hill, Halloween showed how real horror is unexpected and unfathomable, and can occur in the most mundane places. It showed the escaped killer: Michael Myers stalking a group of girls on a seemingly ordnary October 31st. 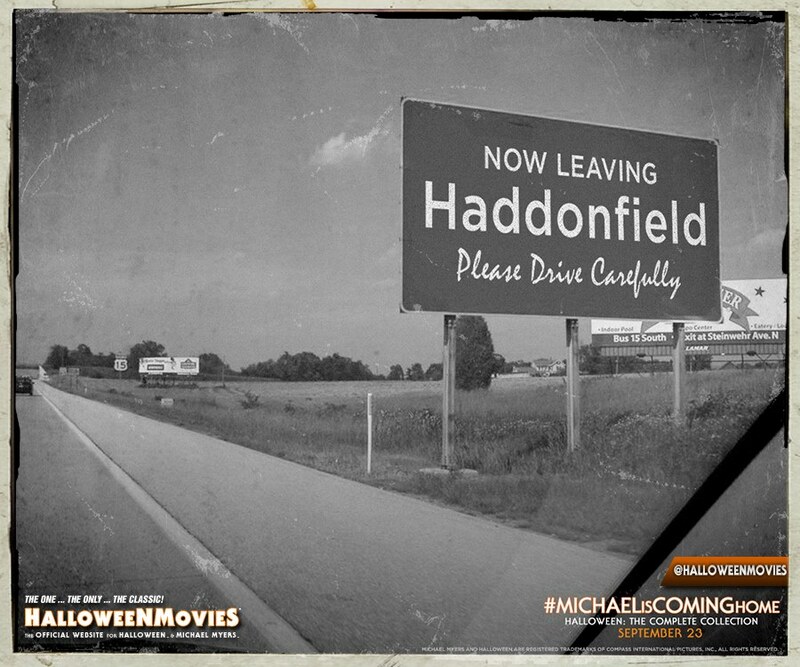 By concentrating the suspense on a quiet and leafy neighbourhood in (fictional) Haddonfield, Illinois, it brought the horror – the dark side of suburbia – closer to home. Halloween (1978) introduced a more gritty type of cinematic fright. It is distinctive in its use of hand-held camera shots, but the fear is arguably heightened immensely through Carpenter’s own eerie synthesizer score. 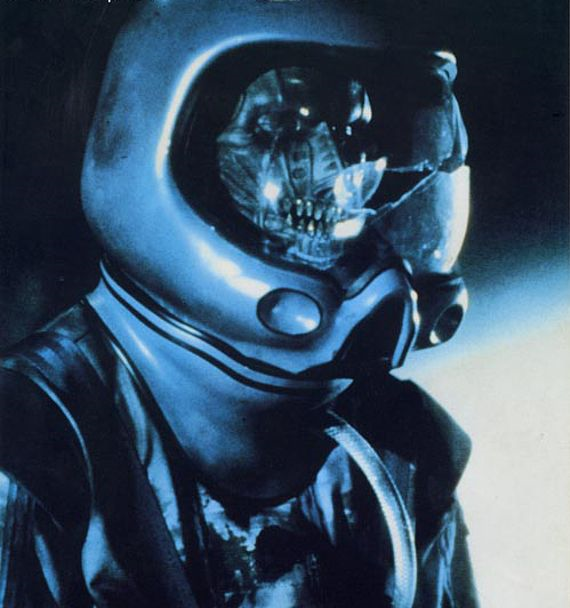 He was heavily influenced by The Thing From Another World (1951) – the film which just happens to be showing on TV that night. “I’m not the Godfather of Gore!” Carpenter protested, as a slew of unwelcome slasher movies flooded the market during the 80s; it is unfair that he has been blamed for their proliferation. Yes, he made a really creepy film in 1978, but no, he cannot be held responsible for a subgenre which relegated young girls to mere murder objects… in the name of movie entertainment! Donald Pleasance played Dr. Loomis (a nod to one of the main characters of Psycho), but it is interesting to learn that Carpenter had sought both Peter Cushing and Christopher Lee to play this role, but they turned him down! No offence to Pleasance (who puts in a reasonable performance) but either of the two first choices would certainly have enhanced proceedings considerably. “People were diappointed because they were expecting to see Jamie Lee Curtis and the Shape… we kept saying: “Look guys, it’s let’s just call it Season of the Witch, it’ll do better,” but they wouldn’t listen…” – Debra Hill. Despite the lacklustre outing of Halloween 2 (1981) – a sequel so inconsequential it has sunk without trace – the powers-that-be sought a Halloween 3. This time, there was a problem: John Carpenter was preoccupied with other projects, and Jamie Lee Curtis had baulked at the prospect of returning once more to play the babysitter-in-danger. Joe (Gremlins) Dante had suggested dropping Michael Myers and trying something more macabre. In 1982, he was fighting a losing battle to develop a Creature From The Black Lagoon remake, so would have been available to handle a third Halloween movie. Luckily, Nigel (Quatermass) Kneale was called in to work on a prospective script. However, the end product proved too bizarre and so far removed from the original killer-in-a-mask premise that potential audiences boycotted it; Dante had left ages ago, and having seen his script rehashed beyond recognition, Kneale requested to have his name dropped from the credits. The result was a true oddity: reviled then and now looking embarrassingly incongruous amidst an otherwise well-regarded cult franchise. This is a pity, for Halloween 3: Season of The Witch (1982) started so well: a frightened man pursued through a dark and stormy night by a band of mysterious smartly-dressed henchmen, accompanied by one-helluva-moody soundtrack (again supplied by John Carpenter, and probably superior to the score of the original movie) before descending into a mediocre and unwatchable mess. 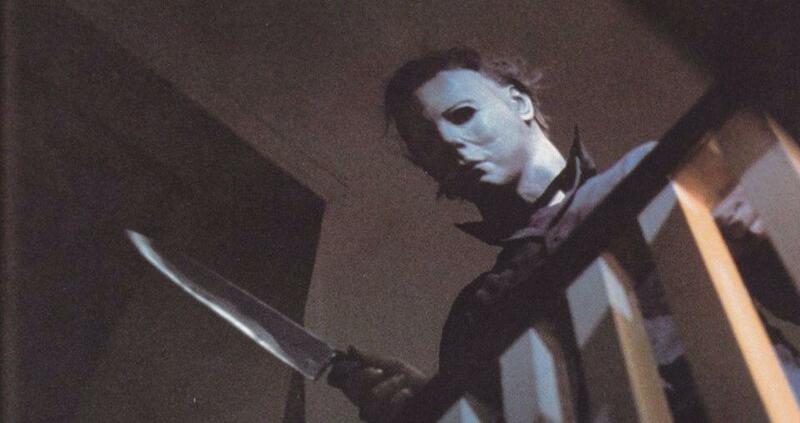 During the 90s, further sequels brought back Michael Myers; there was even H20 (1998). To celebrate the original film’s 20th Anniversary, Jamie Lee Curtis returned to face her nemesis one last time. Actor. Gentleman. Scientist. Vampire Hunter. Time Lord. Detective. Imperial Badass. “The most professional actor I have ever worked with. He’s highly regarded all over the world as a brilliant actor, and deservedly so. If they knew what we got up to on the set in every film we’ve made… the imitations that I used to do, the dances that he used to do… ” – Christopher Lee. There is one reason why horror movies no longer appeal to me. They are certainly a barren and soulless place without the late great Peter Cushing (1913-1994). Best remembered for producing the definitive versions of Baron Frankenstein and Van Helsing for Hammer horror films, he was an actor of exceptional range and skill. In 1957, he appeared in Curse of Frankenstein, playing the notorious scientist totally different to the pained and remorseful character envisaged by Mary Shelley. Cushing’s Baron Frank was a cruel and cunning piece of work, who is prepared to push a visiting professor to his death just to get a head. The monster was played by fellow horror maestro: Christopher Lee. It not only marked the establishment of a formidable partnership, but a lifelong friendship. Its stupendous success led to another interpretation of an infamous gothic character the following year. 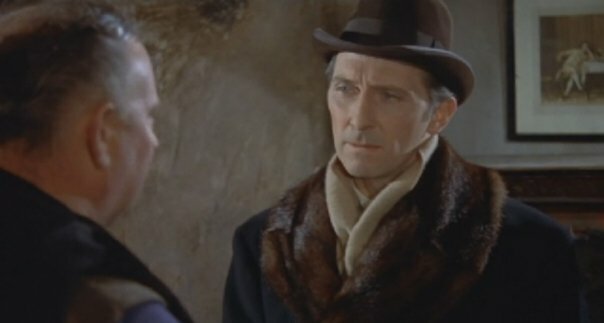 Dracula (1958) certainly gave the opportunity for Lee to create a career-defining performance, but in Van Helsing, Cushing was calm and collected, sensitive yet determined, and ultimately presented an admirable adversary. 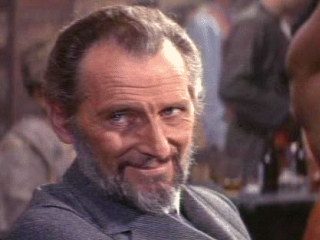 It’s amazing to consider now how energetic both roles were: the gripping climax in which Van Helsing runs the length of a banqueting table, tears down the curtains and lunges at a sunstruck Dracula with two silver candlesticks pressed together to form a crucifix is said to have deen devised by Cushing himself! “When he did Sherlock Holmes, he went to a very famous teacher of the violin so that he knew how to hold it… When he was making The Mummy, he went to the hospital and and sat in with operations. He was very meticulous…” – Joyce Broughton (his secretary). 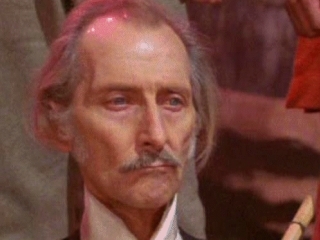 Peter Cushing could adapt to any role. In 1959, he played Sherlock Holmes in Hammer’s The Hound of the Baskervilles. Directed by Terence Fisher, many Holmes afficianados consider Cushing’s detective as the definitive article. In 1965, the success of BBC’s Doctor Who led perhaps inevitably to the big screen. 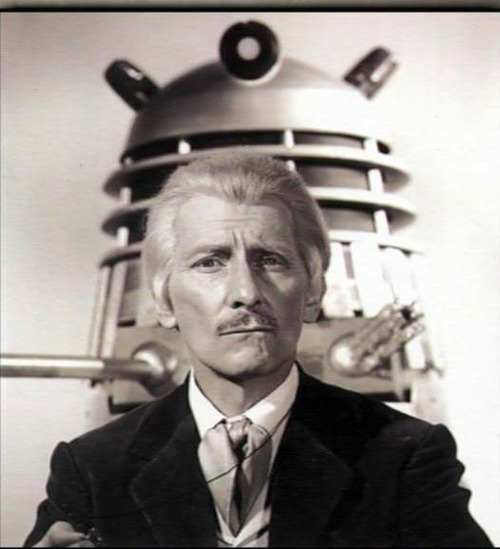 In order to maximise transatlantic appeal, Cushing was cast in place of William Hartnell, playing the Time Lord as an endearing grandfatherly figure in Dr Who and the Daleks. Its phenomenal success led to a sequel: Daleks’ Invasion of Earth: 2150 AD. (1966). “The boots they gave me [to wear as Grand Moff Tarkin] were far too small. I said to George: ‘…whenever possible, could you please shoot me from the waist up?’ He very kindly agreed… I was really wearing carpet slippers. 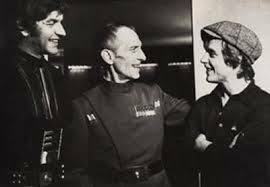 That is why Moff Tarkin was so hostile… his feet were killing him” – Peter Cushing. The passing of his beloved wife Helen in 1971 devastated him. In subsequent years, he made movies of a distinctly lesser quality; this was a concerted attempt to keep his mind occupied as he adjusted awkwardly to a crushing existence of loneliness. Maybe George Lucas was a Hammer fan? This would help explain Cushing’s appearance in the original Star Wars (1977) as Grand Moff Tarkin: a brief, yet deliciously malevolent turn. No other actor could lace the phrase: “You may fire when ready” with such bloodcurdling doom! Nevertheless, in real life, Peter Cushing was a kind and gentle fellow, always approachable, and never said a harsh word about anyone. 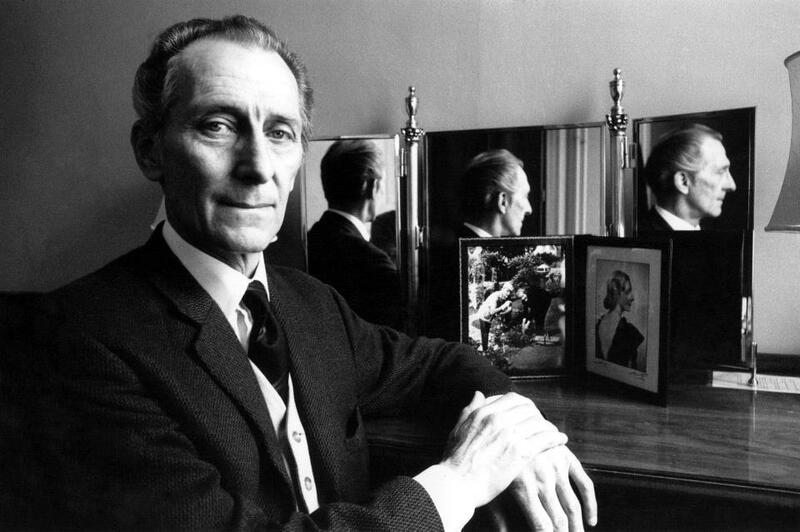 Although honoured with an OBE in 1989, Peter Cushing never won any movie accolades; yet surely he has topped most horrorfans’ and movie-goers’ polls and – as new generations discover the various gems of his amazing career – he will continue to do so. Dracula Unwanted: NO Vlad For Brad! Vampires are make-believe, just like elves and gremlins and eskimoes. 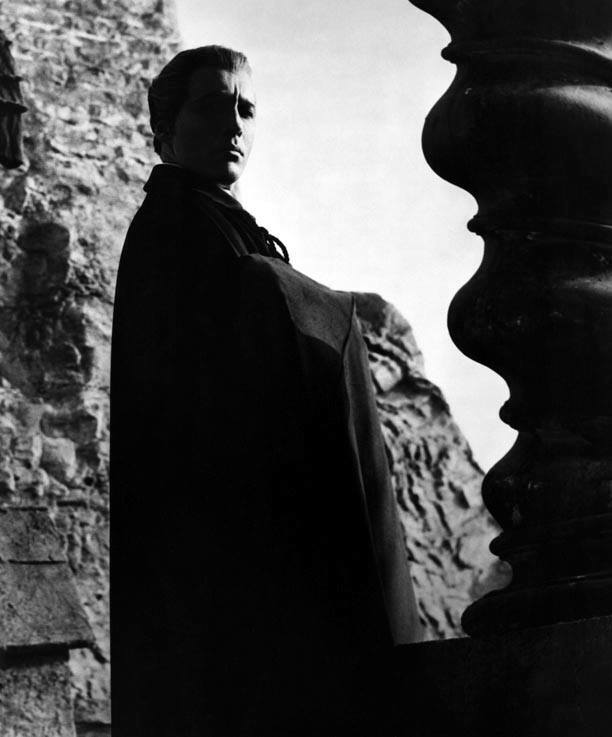 “It is time for our culture to abandon Dracula and pass beyond him” – Robin Wood. With Halloween just a week away, it seemed appropriate to select a topic on fear and dread and all things undead. What better subject than vampires to concentrate on? Unfortunately, any movie featuring fangs, long capes, dodgy Eastern European accents or Robert Pattinson has become strictly off-limits. It has come to the pathetic point that any mention of vampires invokes connotations of mediocrity and monotony, while the very mention of the name: Dracula is likely to send me into fits of boundless irritation. 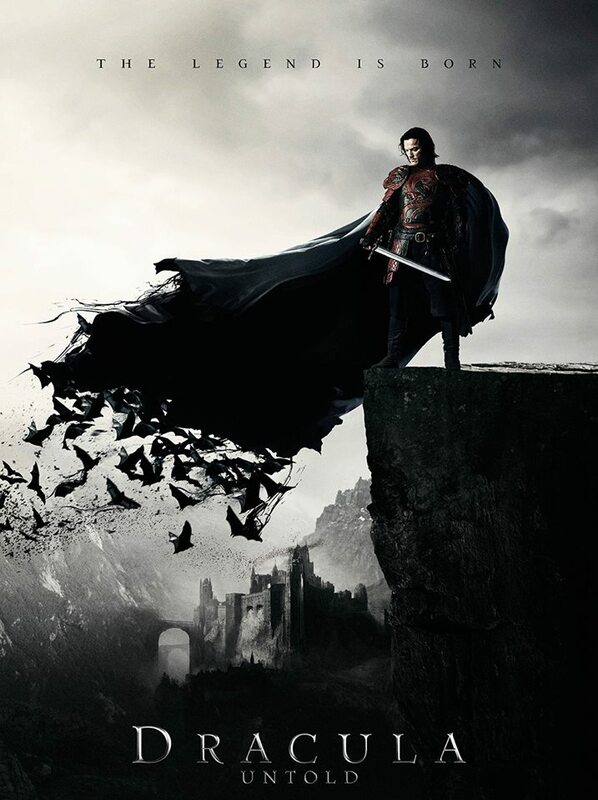 So, here we go again: the release of Dracula Untold has – not surprisingly – been met with a critical mauling, and less-than-encouraging cinema attendances. At least it concentrates on the origin story of Vlad the Impaler. Let’s face it: this is the only direction with which Stoker’s tired and moribund story could still be tolerated by an equally tired and indifferent cinema-going public. “Our very first encounter began with me storming into [Peter Cushing’s] dressing room and announcing in petulant tones: ‘I haven’t got any lines!” …and he said drily: You’re lucky. I’ve read the script'” – Christopher Lee. Had to rush home the other night to watch the 1958 Dracula on TV – it still proves to be a rare absolute joy; it deserves to be regarded as the greatest vampire movie ever – the pinnacle to which lesser bloodsucking bios strive but always seem to fail spectacularly. 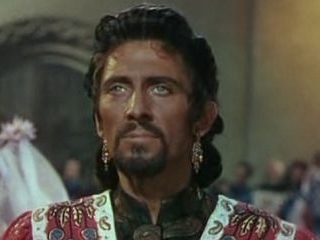 Christopher Lee produced a fabulous (not to mention frenetic) performance to become the definitive Prince of Darkness. Yet it is Peter Cushing as his nemesis: Van Helsing who really enhanced the material, helping to turn it into a compelling drama. It could be argued that without these two icons – at the height of their powers – it seems unfeasible that Hammer Studios could have flourished for as long and successfully as it did. “Dracula remains dead and well (or dead and loving it); other monsters merely endure. After Bram Stoker’s Dracula, their revival became obligatory” – Kim Newman. It seems somewhat inevitable that this struggling post would twitch and stagger to the ubiquitous subject of vampires. For a brief period during the 80s we could enjoy an original and enjoyable revival of the fanged ones, with Fright Night (1985 – yay, Roddy! 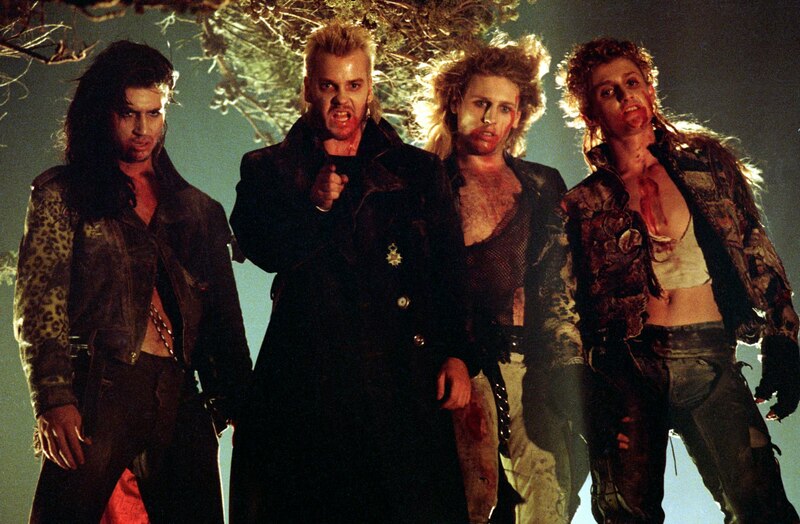 ), cult classic Near Dark (1987) and the real “children of the night” The Lost Boys (1987). Yet somehow, as Francis Ford Coppola’s bold and lavish “faithful” adaptation of the the novel: Bram Stoker’s Dracula (1992) failed to attract my interest. 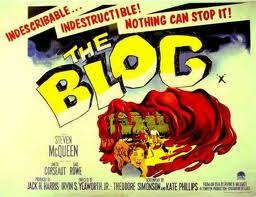 For all its grandeur, it made for turgid viewing. 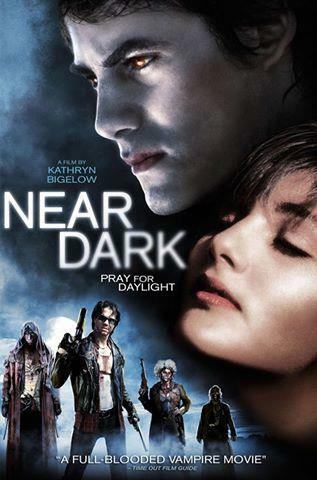 The only true scare to be gleaned from this whole wasted effort was being subjected to Keanu (“severe drop in cinema attendances”) Reeves as Jonathon Harker. Oh, The horror, the horror! By far the worst offender came in that feckless dire heap known as Van Helsing (2004), wherein Hugh Jackman showed that he just could not step into the substantial and hallowed shoes of the late, great Peter Cushing. When Kate Beckinsale co-stars in figure-hugging black, you realise how desperate the film-makers really are! Naturally, this led to more unbearable tosh in the wretched form of Underworld and its unwanted stream of vacuous sequels… and now the reboot has just been announced!…? And – ye gods! you lucky mortals! – you’ve been spared my rant against Twilight! No matter how many silver crucifixes you stow away, or how much garlic you secrete about your person, there will always seem to be an unending supply of intolerable vampire movies ready to give horror movies a bad name. “The biggest problem, of course, was: What’s the alien going to look like? I mean, you could screw around… trying to come up with something that wasn’t all nobs and bobs… When I went into Fox for the first meeting, they had a book there by H.R. Giger: The Necronomicon. I took one look at it, and I’ve never been so sure of anything in my life” – Sir Ridley Scott. With Halloween just weeks away, it would be cool at this point to just break away from the usual SF themes explored in this Blog, and delve into something darker and more sinister. 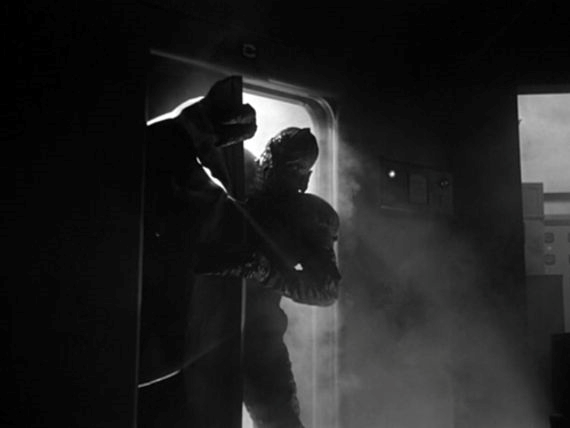 The cold and cruel depths of outer space seems like an all-too-obvious choice in which to set horror movies. A quick glance over the last 35 years since Ridley Scott’s seminal sci-fi shocker: Alien reveals that the challenge was met with some gruesome, sleazy and downright odd specimens! A whole spate of low-budget video nasties offered a range of horrendous xenos (of the cheap and nasty kind!) and delivered a standard mix of gore, dimly-lit scenes and a copious supply of invariably loud and incredibly dumb humans whose chances of survival were just as miniscule as their “acting” abilities. Let’s rummage through the bargain bin of bug-eyed beasties and see what this SF/Horror hybrid really looks like! So, anyone fancy a bug hunt? “Giger seems to be painting aliens, but the closer you look, the more you realise he’s painting twisted versions of us” – Clive Barker. The term: “xenomorph” was first used in connection with the weird cyclopean entities of It Came From Outer Space (1953). With their spacecraft having crashlanded in the Arizona desert, these aliens could take on human form, but in the rare glimpses of their natural forms, they were truly terrifying. 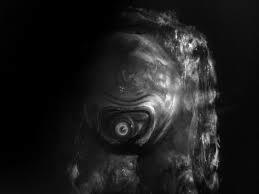 Possibly the grandaddy of sci fi-horror beasties would have to be It! The Terror From Beyond Space (1958). Having gone to the trouble of creating a genuinely scary-looking “Terror,” the creature still hid in the shadows for maximum shock effect (not to mention to make the most of a miniscule budget!) It! holds a special place in this Post, being widely regarded as the primary influence behind Ridley Scott’s vision. 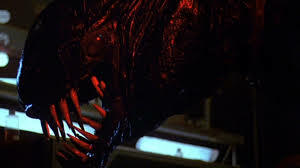 Alien (1979) is justifiably considered to be the pinnacle of SF/Horror; not only does it capture the claustrophobia and debilitating loneliness on a space freighter in an unknown sector of the galaxy, but it also can be treated best as a traditional haunted house story set in deep space. The biomechanoid design of the xenomorph by the late great H.R. 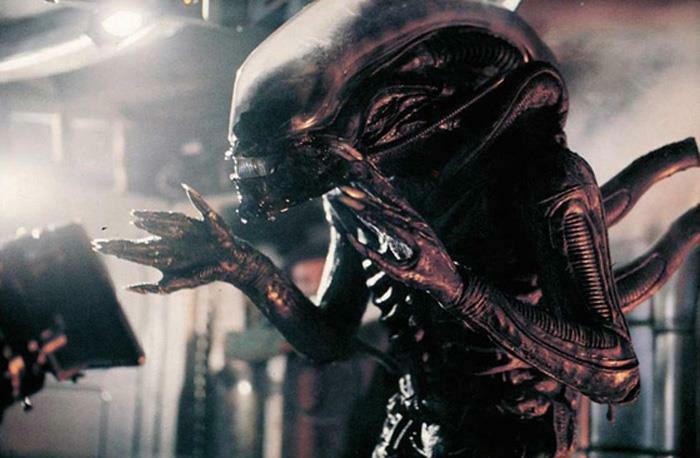 Giger has stood the test of time as one of cinema’s greatest creations. The Swiss surrealist artist derived his unique style from his own nightmares; how fitting then that he has gone on to disrupt the sleep of many others! And ya know what? Harrison “I’m Han Solo/Indiana Jones, get over it” Ford turned down the opp to play Captain Dallas(! ), while Peter “walking carpet” Mayhew lost the chance to don that infamous xenomorph suit. “I find that hard to believe,” said Ripley incredulously. “You still don’t understand what you’re dealing with, do you? Perfect organism. It’s structural perfection is matched only by its hostility” – Ash. During the mid-80s, there were hordes of downright despicable carnivorous aliens on bloodthirsty rampages in SF movies, at a time when slasher flicks were dominating the shelves labelled: “Horror” in every video rental shop. Despite this serious lack of variety, this blogger nevertheless confesses to have rented out (almost thirty years ago, of course) some of these cheap and (below) average Alien clones on too many weekends to mention. Among them, the likes of Star Crystal and Titan Find would get screwed up played in my long-suffering VCR. Actually, these rip-offs were just as ridiculous as they were unlimited. To illustrate this extreme situation, take for example: Galaxy of Terror (1981) (aka Planet of Horrors) produced by Roger Corman, and then Forbidden World (1982) (aka Mutant) produced by (yes!) Roger Corman – very confusing, especially considering how their equally shoddy production values made them virtually undistinguishable! Interestingly enough, considering the tacky nature of the special effects, more or less the same team responsible for Titan Find (1985) would reunite shortly after for another marauding monster vs. hapless humans thrill-fest. Only this time the effects were supervised by an FX Master: Stan Winston, and a certain James Cameron was onboard to direct the Mother of all Bug Hunts: Aliens (1986). 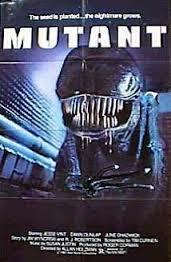 It’s ironic to think that the only true rival to Alien came in the form of its own sequel! (There is too much to say about this veritable Classic, so will deliver a Post devoted to this some day soon). Back to the old freezerinos.